Claude Monet (1840-1926) was born in Paris and grew up in Le Havre, where his artistic career began during his teens. Monet was gifted with a pencil and paper and he quickly learned that he could earn good money drawing and selling charcoal caricatures of the townsfolk. He was quickly talent-spotted by the artist Eugene Boudin who encouraged him to turn his hand to painting landscapes in the great outdoors - a direction that was only possible through the relatively new invention of oil paint in tubes in 1841. In 1859, aged 19, Monet travelled to Paris to develop his artistic career, where he studied at the Académie Suisse. During his time in Paris he met many artists including Renoir, Sisley and Bazille, and the four of them would often go on en plain-air painting trips together, bouncing ideas of each other. They would later go on to form the impressionist movement, which was predominantly grounded in painting outdoors. In 1874 Monet, Renoir, Pissarro, Manet and others were struggling to get their work accepted into the conventional Salon, so they banded together to form the “Société Anonyme des Artistes, Peintres, Sculpteurs, Graveurs etc” as an alternative. At their first exhibition the title of one of Monet’s works, “An Impression, Sunrise” gave the whole impressionist movement its name. In 1883, aged 43, Monet moved away from the city and settled in Giverny, where he diverted the local river and built a waterlily pond in his garden. As with many of his subjects, he obsessively paint this same scene over and over again in different light and weather conditions. There are over 250 paintings of this pond, and he probably destroyed many more through self-doubt and depression. Towards the end of his life Monet suffered from cataracts and was almost blind when he died in 1926. In the last 10 years of his life he painted a series of very large canvases, 12 of which were promised to the French nation as a monument to peace and are now on display at the museum of the Orangerie in Paris. The canvas that we are going to reproduce, “Water-Lilies”, is one of the set painted between 1916-1926 that was not promised to the French nation and is currently on display in room 43 at the National Gallery in London. It is a VERY big painting so please consider where you will display it before you work out which scale to work in. It may more practical to choose a scale that is not accurate for your house but will at least fit inside it! Monet worked his paintings on canvas. 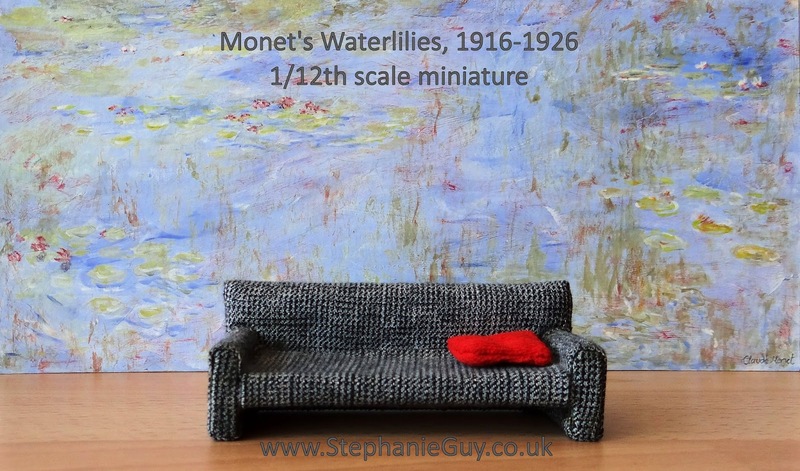 To recreate Water-lilies in miniature we need a support that will give the impression of a miniature canvas but without the weave of the canvas dominating the finished painting. I recommend using off-cuts of smooth mount board, easily obtained from a framing shop - if you ask nicely the proprietor will probably give you his off-cuts for free. Monet’s painting measures a huge 200.7 x 426.7 cm. That’s over 4 metres long so think carefully about where you will display your miniature version of this piece before you start! To find how big yours needs to be simply divide these measurements by the scale you're working in. On a 1:12th scale, dividing by 12 will give us = 16.7 x 35.5cm; for 1:16th we need to divide by 16 to get 12.5 x 26.7cm, for 1:24th divide by 24 giving 8.36 x 17.8cm. This would be a good piece for those of you who like to work in 1:48th scale as your measurements will be 4.2 x 8.9cm. The drawing for this piece is very straight forward, we just need groups of lily pads in the right places. I recommend using a simple grid, keeping your grid lines and pencil marks as faint as you can. Divide your canvas into 4 x 4 equally spaced sections. They will not be squares since your canvas is rectangular, but I will call them squares for simplicity’s sake. For this article I have drawn my gridlines heavily so that you can see them, but please draw your grid lines very faintly so that you don’t need to worry about paint coverage later on. Cut a piece of acetate or cellophane and trace your drawing using the marker pen. If your acetate is larger than your canvas then remember to mark the corners so that you can match it up with the canvas later on. Squeeze out 5cm of Tinting White and a small blob of French Ultramarine. Add the blue to the white to loosely mix a pastel blue. Using the size 16 flat brush entirely cover your canvas in pale blue. Make the blue varied in colour and texture across the whole piece, using different directional brush strokes. You will cover your pencil marks completely – this is why we have made the acetate so that we can position our lilies correctly later. Squeeze out some Yellow Ochre and mix with the white. Then add this mix to the edge of your pastel blue until you have a very pale green-gold. Once the blue paint in your canvas is touch dry, place your acetate over it to locate the position of the main lily pads. You can gently mark them in pencil over the blue paint if it will help you. Then, using the green-gold and a size 4 round brush, very loosely mark them out. Squeeze out a very small amount of Burnt Sienna. Spread the edge out thinly in your palette and pick up a tiny amount on a clean size 4 round brush. Twirl this around against a clean section of your palette so that you have the tiniest amount of paint along the outside edge of your brush. Using the side edge of your brush, apply the Burnt Sienna to the top right hand corner of the painting. This is known as a dry brush technique. Work your way around the whole of the top right hand quarter adding Burnt Sienna using the dry brush technique. Notice that except at the very top of the painting, the majority of the brush strokes are directional, with your brush moving from bottom to top. Continue in the same way for the bottom right. The whole piece should look something like this. Squeeze out a tiny amount of Crimson and using the dry brush technique with the tiniest amount of paint on your brush, scrub over the top right hand quarter of the painting using horizontal strokes. Take care to leave some areas without any red as per the photos. Repeat for the bottom right hand quarter. More of the same for the bottom left hand quarter. And the top left hand quarter. Mix Yellow Ochre, French Ultramarine and plenty of Tinting White until you have a green-gold similar to the one in SG 05. Then add a touch more blue to one side of your mix. Use the darker of these colours to add in the green in the top right with your number 4 round brush and the dry brush technique. Occasionally add in some of the lighter green-gold for variety. Continue in the same way in the bottom right hand quarter. You can use your acetate overlay to help you identify where the vertical strokes need to be. The top left hand quarter uses horizontal strokes. The whole should look something like this. Add a very subtle layer of Burnt Sienna over the green gold, again using the dry brush technique. Now we’re going to swap to the size 00 round brush and look at the lilies in detail, beginning with the top right section. Using the darker of the green-gold mixes, add in some lowlights. Mix a small amount of Arylamide Yellow Light and Tinting White with the palest of your green gold and use this to add highlights, keeping the lines as vague as possible. Using pure Tinting White on the tip of your size 00 brush, sweep in the white highlights on the lily pads. Next, dab in 3 marks each for the lily flowers on the right hand side. Smudge in a little crimson at the base of the flowers and inside the white sweep on the left hand lily. Moving on to the middle right hand batch of lilies, add Arylamide Yellow Light in a circulare sweeping motion to the lilies that you already have, plus a couple more above. Add pure Tinting White, again in broken circle motions both on and around the lily pads. Pick up a touch of Burnt Sienna and brush most of it off in your palette or on a scrap of paper. Then add in the faintest hint of colour on the top of the middle two lilies. Now we’ll move on to the bottom right lilies. Using the green-gold mix, add lowlights to the lily pads and strengthen the vertical pond weed marks. Add in a touch of pure Yellow Ochre to the centre of the dominant pond weed, again using a vertical brush stroke. Add Tinting White highlights on the lily pads and around to create ripples in the water. Using a mix of French Ultramarine and Tinting White that is slightly darker than your background, paint in lowlights to accentuate the ripples. Let’s move on to the lily pads in the bottom left hand corner. Add a touch of Arylamide Yellow Light to a section of your green-gold to warm it up a bit. Using the tip of your 00 brush add warm lights to the top of the lily pads and then use the side of your dry number 4 brush to scrub in some warmth all around this bottom quarter. Leave some areas without the warmth for contrast and interest. To create a sense of movement around these lily pads use Tinting White to add in ripples and highlights. Next pick up some of your original green-gold and paint this in next to some of your ripples to create depth. Add a touch of French Ultramarine to the green-gold and use this to add depth to some of your other ripples. The most central ripples are given depth by using French Ultramarine mixed with Tinting White that is a shade darker than the background blue. Finally for this section we need to add in the flowers. Pick up a tiny amount of Crimson on your size 00 brush and wipe most of it off against the side of your palette. Then paint in the 5 flowers beginning with the one on the right and working left. The two at the top left are barely there at all. Next add pure Tinting White to create the highlights. Now for the final set of lily pads in the top left hand quarter. Using pure Arylamide Yellow Light and a horizontal stroke with your size 00 brush, add highlights to your lily pads. I found my acetate drawing very useful at this point to confirm where they should be. In the same way as the bottom left lily pads, we need to create movement. Using Tinting White, green-gold and the French Ultramarine/green-gold mix, add ripples and shadows. Most of the brush strokes are horizontal with the occasional wiggle. As before, use tiny amounts of Crimson to dot in the flowers, and then go over parts of the Crimson with pure Tinting White to add highlights and blend in the red. Moving on to the final set of lily pads at the very top left, use your three shades of green-gold and Tinting White to create the hints of the lily pads. There are no distinct pads here, just greenery and ripples in the water. As before, dot in the Crimson red flowers and then highlight with Tinting White. Take an objective look at your painting. Step back and squint at it, hold it up to the mirror, take a photo of it on your phone or digital camera – any of these techniques help to create some distance between yourself and your work, and usually any errors will jump out at you. Study it carefully and make improvements where necessary. Any areas that are too blue can be toned down with green-gold using vertical strokes and the dry brush technique. Finally, we need to sign the painting. Practice Monet’s signature on a scrap of paper before signing in the bottom right hand corner. Monet used paint but on this scale that would be incredibly difficult so I recommend using pencil. If you have a go at any of my painting tutorials I’d love to see your artwork, you can share it in the comments below, on my facebook page or email it to me. You can also comment below if you need help with any of these instructions.